A newly developed colorimetric microdilution method was used to analyze the activity of 12 antimicrobial agents against nine Borrelia burgdorferi isolates, including all three genospecies pathogenic for humans. In addition, in vitro antimicrobial resistance patterns of Borrelia valaisiana and Borrelia bissettii tick isolates were investigated. The applied test system is based upon color changes that occur in the presence of phenol red and result from the accumulation of nonvolatile acid produced by actively metabolizing spirochetes. After 72 h of incubation, minimal inhibitory concentrations (MICs) were determined from the decrease of absorbance by software-assisted calculation of growth curves. MIC values were lowest for azlocillin (MIC, ≤0.125 μg/ml), ceftriaxone (MIC range, ≤0.015–0.06 μg/ml), and azithromycin (MIC range, ≤0.015–0.06 μg/ml). 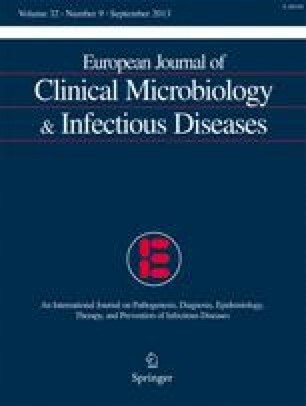 Whereas tobramycin (MIC range, 8–64 μg/ml) exhibited little activity, spectinomycin (MIC range, 0.25–2 μg/ml) showed in vitro antimicrobial activity against Borrelia burgdorferi. The MICs of penicillin G for Borrelia afzelii isolates were ten times higher than those for Borrelia burgdorferi, Borrelia valaisiana, and Borrelia bissettii isolates (P<0.05) and 100 times higher than those for isolates belonging to the genospecies Borrelia garinii (P<0.05). Further significant differences with respect to the MIC values of the other antimicrobial agents tested were not noted. The colorimetric microdilution method offered the advantages of reliability, reproducibility, and convenience and could handle large numbers of isolates and antibiotics.